Montana is full of rivers. Thousands of miles of rivers snake their way across all corners of the state. And these rivers offer superb fly fishing for trout. Yet, many rivers in Montana aren’t friendly to the wade angler. Often, a river is too wide, inaccessible, or deep for effective wade fishing. Or the wade angler simply wants to find fishing holes that aren’t overrun with other wade anglers. Because of the challenges wade anglers face, many anglers prefer to float fish in Montana instead of wade fish. By float fishing a Montana river, an angler can reach inaccessible fishing holes and easily fish both sides of the river—not to mention having a wonderful float trip, too. For solo anglers in search of a boat to fish a Montana river, by far the most popular “solo fly fishing boat” is the pontoon boat. For solo fly fishing, few boats match the versatility and cost of a pontoon boat. Pontoon boats provide solo anglers with an easy, and affordable, method to fish endless miles of Montana’s rivers. In short, if you need a dedicated (note the emphasis on dedicated) boat for fly fishing, a pontoon boat is often an excellent choice. A pontoon boat consists of two large air bladders connected together either by a metal frame or a curved air bladder (for frameless pontoon boats). The angler sits directly between the two air bladders. On metal-frame boats, the seat attaches to the frame and resembles seats found in larger fishing boats. For frameless boats, the seat type varies. Some frameless pontoon boats use inflatable seats which are “built-in” to the boat (when the boat is inflated, the seat inflates too). Other frameless pontoon boats use detachable seats. 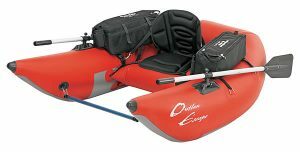 For detachable seats, the angler attaches them to the boat through the use of built-in D-Rings and straps. The maneuverability of pontoon boats is excellent. The pontoons of the boat slice through water with ease. To maneuver the boat, the angler uses two oars. The oars attach to either the oar lock that is part of the metal-frame (for metal-frame pontoon boats) or which is built-in with the frameless pontoon boat. Regardless of frame style, the ability to use two oars to paddle provides excellent maneuverability and makes long paddles across the water relatively simple. Pontoon boats, moreover, have been designed specifically for fly fishing. As such, the boats often come with many features angler’s appreciate—from rod holders to the ability to easily attach various fishing accessories to the boat’s frame. Frameless pontoon boats have become increasingly popular, and for good reason. The primary benefit of a frameless design is simple assembly and disassembly. There is no metal frame to assemble or that poses problems for storage and transport. With a frameless pontoon boat, the only “assembly required” is to pump the boat full of air, attach the seat and oars, and you’re done. A Sea Eagle Frameless Fishing Boat. Note the pontoon style. A very versatile fishing boat that looks quite different compared to other pontoon boats. Another benefit of frameless pontoon boat is their increased weight capacity. Since the “frame” of frameless pontoon boats consists of air bladders, the extra air provides a larger weight capacity—often adding an additional fifty to one-hundred pounds of capacity to even small boats. So what’s the drawback of frameless pontoon boats? Other than price, there aren’t any. Frameless pontoon boats are simpler to assemble, possess larger weight capacities, weigh less and generally have better whitewater performance compared with their metal-frame cousins. Frameless pontoon boats are also much easier to store and transport. While frameless pontoon boats cost more, the price difference isn’t substantial and is money well spent. There are four primary types of pontoon boats available for fly fishing. While looks and features of pontoon boats vary among manufacturers, all boats can be classified into four types. Each pontoon boat type has a particular use. Because of this, anglers should give careful thought to how and where they fish. Anglers should also consider whether the boat will perform other duties, such as recreational floating. This is the most common pontoon boat available. These boats have a weight capacity between 250-400 pounds. The boats are relatively lightweight and fairly easy to assemble. While most anglers don’t disassemble the boats after each use (most people carry standard one-person pontoon boats on roof racks or in the beds of pickup trucks), these boats are light enough for one-person to easily manage transporting. Prices of one-person pontoon boats vary, depending on features and construction. Yet, in the end, all standard one-person pontoon boats perform the same function—to provide a floating platform for effective fly fishing. Two-person+ pontoon boats are designed to carry two or more people. This design, not surprisingly, causes these boats to be large and heavy. This boat type lacks the portability and ease of setup found in the standard one-person pontoon boat. Except for winter storage, anglers rarely disassemble these types of boats (and for winter storage, most people store their boats fully inflated in a garage). Finally, due to their large size and heavy weight, an angler needs a trailer to transport these boats. This term has potential to mislead. All standard one-person pontoon boats are packable if done “creatively.” The angler might need a strong back—and a large backpack—to make it to their destination. But even larger, one-person pontoon boats can be packed if necessary. It just isn’t necessarily easy. A Sea Eagle PackFish. A great example of a true backpackable raft. The Packfish is a bit of a hybrid between a tiny raft and a small pontoon boat. Weighs 21 lbs. In contrast, a true “packable” pontoon boat is specifically designed for simple transport to remote waters—with no creative packing ability or ultra-strong backs needed. Years ago, this style of pontoon boat was difficult to find. But advances in technology—and angler demand for something to use in remote waters other than a float tube—have increased availability of packable pontoon boats. The Sea Eagle PackFish is a great example of a boat in this class. Packable pontoon boats, when compared with standard one-person boats, are smaller, lighter, easier to assemble and have less bulk. For pure versatility, packable pontoon boats are great little boats, since anglers can use them in remote waters once reserved for float tubes and smaller inflatable kayaks and rafts. Yet, these boats have some drawbacks. Because of their smaller size, packable pontoon boats have a reduced weight capacity. They also tend of offer fewer of the “fancier features” found on larger, one-person pontoon boats. And last, packable pontoon boats are meant for use on lakes and rivers with slower currents. They aren’t the best fishing vessel for rivers that have whitewater or swift currents. The pontoon boat-float tube hybrid, sometimes called a kick boat, is an interesting boat. 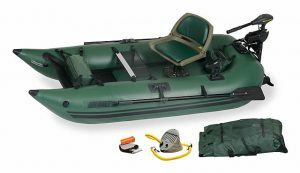 This boat combines some features of a packable pontoon boat with some features of a float tube. With this pontoon boat, the angler sits between two large pontoons with only their legs in the water. Similar to a float tube, the angler maneuvers by kicking—not paddling. This pontoon boat type is simple to pack to remote water because of its lightweight and reduced bulk. And because the angler sits “out of the water,” waders aren’t needed. The boats do have drawbacks. On larger rivers or in swift currents, the boats can be exhausting to maneuver. Also, anglers will often bash their legs into underwater obstructions—especially in shallow water or in whitewater. Because of these drawbacks, hybrid pontoon boats are ideal for rivers that have steady (not too fast, not too slow) currents, lack significant whitewater and have enough depth to allow easy kicking. Designed for Fly Fishing – Similar to drift boats, pontoon boats are designed specifically for fly fishing. Because of this, pontoon boats have the necessary pockets, features and design to allow easy fishing while floating. In other words, an angler will find that a quality pontoon boat offers all those “little things” to help make a day spent fly fishing productive. Portability – Except for the larger, two-person+ types of pontoon boats, all pontoon boats are portable. One person can easily transport, and assemble if need be, any of the smaller pontoon boats. Versatility – While pontoon boats are ideal fly fishing platforms, they work well for other water-borne activities, too. All pontoon boats can handle at least Class II whitewater, and many pontoon boats are rugged enough to handle Class III and, on occasion, Class IV whitewater. Moreover, pontoon boats have enough weight capacity and storage space to allow for overnight float trips. While an angler won’t want to take longer multi-night float trips using a pontoon boat, for just one or two nights out, pontoon boats can work well. Not Ideal for Recreational Floating – Due to their emphasis on fishing, pontoon boats aren’t ideal boats for “lazy floats along a river.” They lack the comfort, and flexibility, found in other boats better suited for lazy river floats such as inflatable kayaks and inflatable rafts. Mainly for Solo Paddlers – Most pontoon boats are designed for solo use. In contrast, almost all inflatable rafts or inflatable kayaks can take two or more people—plus their gear. Anglers that need a larger boat have limited choices, since there are few styles of two-person+ pontoon boats available. 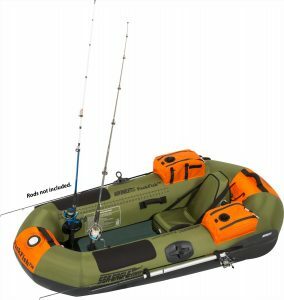 Typically, anglers seeking larger boats gravitate towards inflatable rafts, inflatable kayaks and drift boats. Not for Pounding Whitewater Use – Pontoon boats vary widely in how well they work in whitewater. Most pontoon boats are designed for Class II whitewater and can, usually, make it through strong Class II rapids or weak Class III rapids. Some of the higher quality boats (and thus the most expensive), can safely navigate stronger Class III rapids and even weaker Class IV rapids. But for true whitewater use, pontoon boats designed for fly fishing aren’t ideal boats. For true whitewater floating, consider buying an inflatable kayak, hardshell kayak, a guide quality inflatable raft or a cataraft. There are two big considerations angler need to answer when shopping or a boat. As discussed earlier, frameless pontoon boats are simpler to assemble, weigh less, have a larger weight capacity and are easier to transport. The downfall of frameless pontoon boats is that, currently, they tend to be more expensive than metal-frame pontoon boats. My suggestion is this. If you can afford it, buy a frameless pontoon boat. If you can’t currently afford the additional cost, then consider saving money for a while so as to be able to later buy a frameless pontoon boat. The reason for this advice is simple. Once you use a frameless pontoon boat, it’s tough to go back! Does the boat have large enough weight capacity to carry you and all your gear? Surprisingly, one-person pontoon boats often have substantial differences in their safe weight carry capacity. For day trips, the weight capacity is only a real issue if the angler is “large.” But many anglers want the option to use their boats on longer float trips. For longer float trips, the necessity to carry more gear requires the boat to have a higher weight capacity. Thus, if you foresee “overnight floats” in your fishing future, give consideration to buying a pontoon boat with a large weight capacity. For weight capacity, my rule is simple – the more you can reasonably have the better. A larger weight capacity just adds to the versatility of the boat and is a “feature” you’ll never regret the boat having. Offline, most fly shops sell one or two styles of pontoon boats. However, selection is often limited. For purchasing offline, you’ll find the largest selection of pontoon boats at the Cabela’s and Bass Pro Shop retail stores. Cabela’s – Has a large selection of boats available. The ability to order the boat online and then pick up at the store simplifies shipping too, especially if you order one of the larger, two-person+ style pontoon boats. 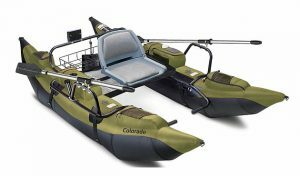 Sea Eagle – Sea Eagle makes their own uniquely designed frameless pontoon boat (called a frameless fishing boat) that’s ideal for fly fishing and is available in several sizes. Numerous options, including motor mounts, allow the boat to be used in a very wide variety of conditions. The PackFish is also a unique boat for those seeking the ultimate in portability. Amazon – Has an extensive selection of pontoon boats, including frameless styles – and usually has the best prices, too. View all Inflatable Pontoon Boats at Amazon.